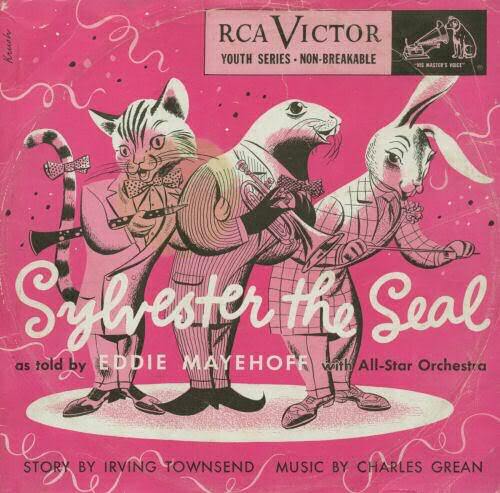 I can’t remember how I first learned of a children’s record, SYLVESTER THE SEAL, which featured Bobby Hackett and other jazz players. (It is not in any discography I know.) But I was terribly excited to find a copy of the two-disc set (two 10″ 78s in a paper sleeve) at an estate sale this summer. I think it is not only an endearing story but a musically satisfying experience. 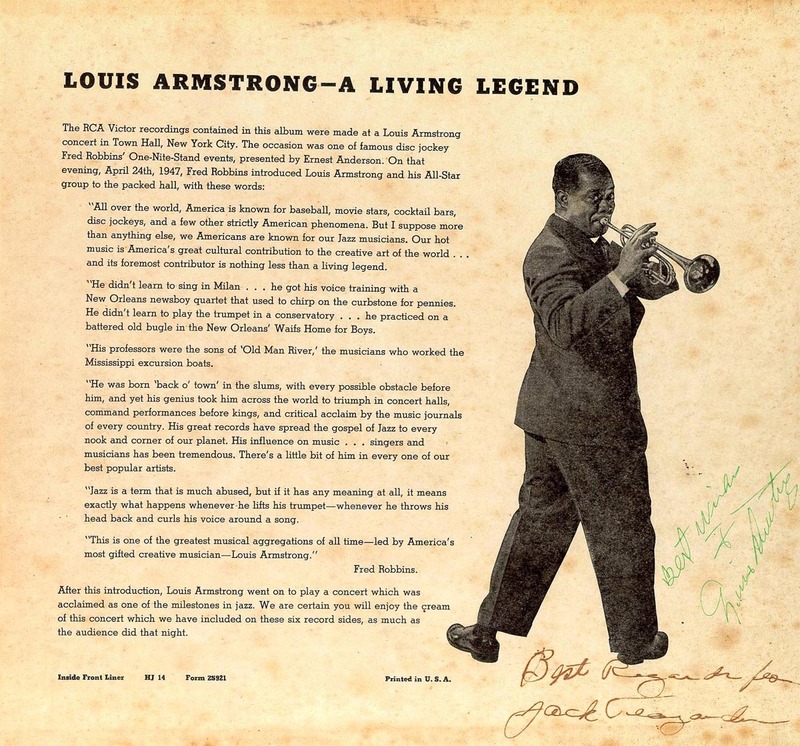 Charles Grean gets credit for the music (several short blues excerpts, variations on YANKEE DOODLE and AT THE JAZZ BAND BALL); Irving Townsend the story — in part an introduction to jazz, but also a fable with an encouraging moral. The narrator, Eddie Mayehoff, was a radio star and comic actor; I presume that one of his routines involved speaking in his version of a seal’s voice, which sounds rather like a person talking with his face half-submerged in the bathroom sink. If any seals read JAZZ LIVES, they can write in and comment on his authenticity. EDDIE MAYEHOFF with All-Star Orchestra (Eddie Mayehoff, narration; Bobby Hackett, trumpet; Will Bradley, trombone; Joe Marsala, clarinet; Peanuts Hucko, tenor saxophone; Sanford Gold, piano; Bob Haggart, bass; Cozy Cole, drums). New York, New York: Monday, December 29, 1947. (It is intriguing — or odd? — that they recorded Parts 2, 3, 4, and 1 in that order.) 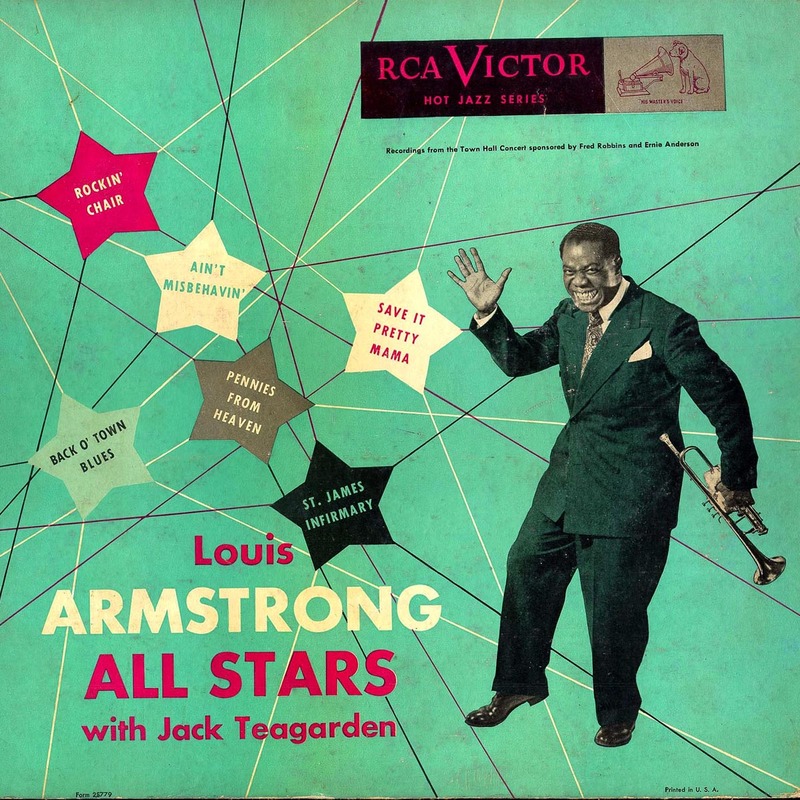 I note that Hackett, Hucko, Haggart, and Cole had worked and recorded with Louis Armstrong that year; in addition, SYLVESTER was completed just before the second Petrillo recording ban of 1948. The records start off inauspiciously, with a stiffly formal trumpet that bears no resemblance to Hackett’s beautiful arabesques, but the atmosphere warms as we hear more from the band. The fourth side is especially rewarding. Thanks, “Furry Jazz,” which can be explored here. That moral? Anything is possible for those who are fervently committed to their goal, who are truly willing to work for it, who will “put the time in,” which is never this easy. But I hope this story encouraged some young listeners on their own paths. It also helps to have wise, kind friends, willing to share what they know. “You could, if you tried,” says Danny Hep-Cat — help we all could use. And Willie and Charlie, Everett and Wellman. Look at the record label, and listen! WHY WAIT FOR THE LAST EIGHT BARS? CLICK HERE: ALL MONEY GOES TO THE MUSICIANS!